A chance to dress up, enjoy a welcome glass of champagne on the Sea Level verandah, Rydges Tradewinds Hotel, overlooking the Cairns Esplanade. What a wonderful way to enjoy a warm tropical evening. The literary dinner has become a signature event within The Cairns Tropical Writers Festival and 2014 is no exception. Previous guests include Nick Earls 2008, Gretel Killeen 2010, Matthew Riley 2012. 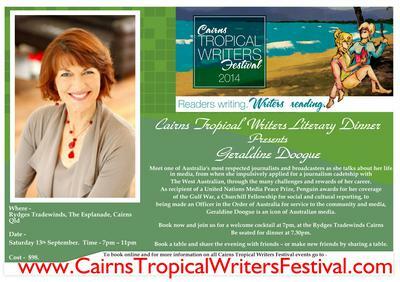 To celebrate the 10th Anniversary of Tropical Writers Inc - the hosts of this festival - the committee is thrilled to announce Geraldine Doogue, iconic journalist and TV personality, as guest speaker. Geraldine Doogue is a journalist and broadcaster who has worked in print media, television and radio for more than four decades. In a career that started with a cadetship at the West Australian, she has gone on to receive a United Nations Media Peace Prize and two Penguin Awards for her major role in ABC TV's coverage of the Gulf War. In 2003 she was made an Officer in the Order of Australia for services to the community and media. A former host of ABC TV's Compass and Radio National's Life Matters, Geraldine is currently hosting Radio National's Saturday Extra. She lives in Sydney. Geraldine releases her book - "The Climb" published by Text Publishing. In this book Geraldine turns her attention to an issue central to our times. How are we, as women, represented at the top levels of power in Australia? In candid and personal conversations with fourteen women leading the way in fields as wide-ranging as business, politics, religion, education and the armed forces, Doogue gets to the heart of what it means to be a woman in power in Australia. Inspiring and insightful, The Climb reveals a varied and at times quite unexpected picture of contemporary Australia. Geraldine's book will be available for sale on the night. This is a unique opportunity to discover more about one of Australia's best known journalists - surely a night not to be missed.